Roughly shred the white meat by using 2 forks and pulling the meat apart. This takes a little bit of time but is totally worth it. I use small dinner forks and hold them close to the ‘business end’ so they don’t bend. If the chicken is tender enough, you might even use your fingers to separate the meat. Mix mayo, mustard, and seasoning together in large mixing bowl. Add chicken, cranberries, scallions, and cashews and mix until thoroughly covered. Let sit in fridge for at least 30 minutes before serving. Enjoy! Let the chicken cool in the refrigerator as necessary. Preheat the cast iron skillet over medium-high heat. Dice the onion and add to the pan. Next rough chop the mushrooms (if not already chopped) and add them to the pan. Next peel and thinly slice the carrots into rings and add them to the pan. Add season salt, garlic powder, and cayenne powder to veggies and toss in 2 Tbsp of vegetable oil. Cook the veggies down until reduced by about 50% and remove from the heat. In the meantime, combine the chicken broth, wine, gravy mix, flour, black pepper and rosemary in a small pot and bring to a boil over medium heat. Stir occasionally to avoid burning. Remove when slightly thickened. Roughly shred half of the white meat by using 2 forks and pulling the meat apart. This takes a little bit of time but is totally worth it. I use small dinner forks and hold them close to the ‘business end’ so they don’t bend. Next dice the other half of the white meat into small chunks, no bigger than ½ inch. You should have about 2-3 cups of chicken total. Add the chicken, gravy mix, and frozen peas to the veggies in the cast iron pan and mix thoroughly. Gently pull each unbaked biscuit apart into 2 slices and lay on top of pot pie mixture. Bake the pot pie for approximately 15 minutes or until the biscuits are golden brown. 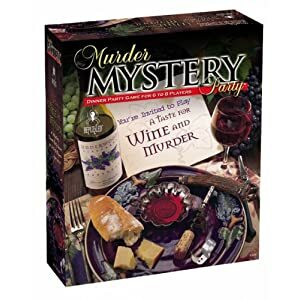 This year my wife and I are hosting a murder mystery dinner at our house to ring in the new year. The plot takes place in California's Wine Country (@ Ravenswood or Barefoot perhaps?!) so we're going with an Italian theme. "It's a tour of California Wine Country with its peaceful vineyards and picturesque wineries. The annual wine-tasting festival is in full swing when the body of local vineyard owner, Barry Underwood, is found hidden beneath his wine-cellar. Barry has been missing for six long years but with the discovery of his body comes a wealth of new clues to solve the mystery. It's a vintage murder and you may be a suspect." And of course plenty of good wine to drink :) Cheers to Happy New Year from the Someday Gourmet! Let the chicken cool in the refrigerator. In the meantime, core and cut the apple into 4ths. Dice 3 of the 4 sections and thinly slice the final section (for a garnish). Place the diced apples in a large mixing bowl, add the cashews and set aside. In a small bowl, whisk together the mayonnaise, mustard, dried herbs and spices. Set aside. Roughly shred the white meat by using 2 forks and pulling the meat apart. This takes a little bit of patience but is totally worth it! I use small dinner forks and hold them close to the ‘business end’ so they don’t bend. Place all of the pulled meat into the large mixing bowl with the apples and cashews. Optional but recommended: Using your fingers, remove the quality pieces of dark meat from the legs and wings and pull. This adds a great additional flavor to the dish and is hard to even discern in the finish product. Finally, add the mayo mixture to the chicken bowl and mix thoroughly with a large spoon. Place the sliced apple on top and serve. This salad tastes best after having a chance to chill for at least an hour. This dish will stay good for about 4-5 days in a resealable container in the fridge. Don’t be afraid to give the chicken a pretty good workout to break it down and increase the creaminess. Add more mayo if the mixture is too dry but be sure to mix well. Preheat the broiler on low with a rack 8" from burner. Arrange bacon on broiler tray and broil for ~10 minutes, flipping at 5 minutes. Be sure to remove pieces just as they turn crispy but before they burn. In the meantime, dice the white portion of the scallions and chop the green section in to rings. Add to a medium mixing bowl. Next, slice the tomatoes into pieces and gently remove some of the juice and seeds by pressing the side of wide-bladed knife into the slices with your palm. Add the rest of the ingredients. Once the bacon is cooked and cooled, chop into small chunks and add to the rest of the ingredients. Mix thoroughly and chill for an hour before serving. Top with parsley for a nice presentation. This recipe works great with low or fat free sour cream and mayonnaise. The bacon is essential though! You can adjust the amount of mayo and sour cream to change the consistency of the dip but don't over do it, their flavor can overpower. Consider doubling this recipe. Trust me you'll need it! Heat a large stock pot over high heat. Add the sliced onions along and begin to soften. Unpack the brats and pierce several times on each side with a fork and add to the pot. Pour in enought beer to completely cover the brats then add in the rest of the ingredients. Cover and bring to a rolling boil. Once boiling, turn the heat back down to a simmer and let cook for 30-40 minutes. Preheat the grill over medium heat and add the brats, cook until desired level of crispiness is reached (I like mine with a bit of a crunch). Serve on a long white roll with sauerkraut and Inglehoffer Hot & Spicy mustard . ** Recipe coming soon, be sure to check back later this week! .....Let me know which recipes you'd like to see! My Zinfandel & Bloody Mary Mix recipe was a big hit last week in our household and it recently made its way into a status update by the Ravenswood Vineyard on their "No Wimpy Wines" campaign Facebook site. Thanks for all the love on the boards Ravenswood fans! Remove meat from refrigerator and place on counter still wrapped to allow to warm to room temperature. Preheat Dutch Oven to medium heat (6) and add bacon. Cook until brown and crispy. Remove and dry on paper towel lined plate. Drain bacon grease except for 3 tbsp and return to heat. While bacon is cooking, clean and rough chop mushrooms then peel onions and cut in half (slice shallots if using). Combine Salt, Pepper, Smoked Paprika and Red Pepper Flakes in a small dish. Remove the ribs from the package and place on a cutting board bone side down. Remove any easily accessible pieces of fat and then rub in a heavy coat of the spice mix on all 5 non-bone sides of each rib. Don’t be afraid to get your hands dirty on this step, you really want to rub it in there. Once the bacon is cooked and removed, add the ribs to the pan in 2 batches (3 at a time is usually right) bone-side up. Proceed to cook each of the 5 meaty sides for 4 minutes each until golden brown. Once placed, DO NOT MOVE THE RIB until time to turn; this will ensure a golden crust. After all the ribs have been completely browned, set aside. Do not drain! Next add all veggies and garlic to the Dutch Oven and cook over medium heat until tender, about 5-7 minutes. Stir frequently. Add 2 cups of the wine, all the stock, Bloody Mary mix, and Rosemary and turn heat up to high and bring to boil stirring gently but frequently. Reduce sauce by 1/3 – 1/2. Add ribs and ensure fully covered by the liquid. Place a piece of aluminum foil over the Dutch Oven and then cover with the lid to securely seal the steam in. Bake for 2.5 hours. Remove from oven and transfer the ribs and any bones that have fallen off to a serving dish. Cover with foil and set aside. Bring the remaining sauce over high to a boil and add the slurry and the rest of the wine. Reduce by 1/3 or so until just slightly thicker, pour over ribs, and serve immediate. Embrace the Bloody Mary Mix. Nearly every recipe out there calls for tomatoes in some form or another for braising. In this case, we get our tomato base but even more layers of additional flavor that just melt nicely into the background of the wine. Good meat in, great meat out. Bad meat in, mediocre meat out. You get what you pay for on this meal and picking up high quality, low fat ribs from your butcher will go a long way. A looong overdue update from the Someday Gourmet! Please excuse the radio silence for the past month or so, it's been a whirlwind of activity on my end and blogging just didn't make it into the schedule. My wife and I officially closed on our first home on April 23rd and we've been running around like mad since getting ready for move-in on June 12th. We've focused most of our resources and energy on renovating our kitchen. I am glad we chose this project right out of the gate as I think it will be the most labor intensive by far. We've been making great progress over the past few weeks removing appliances, sanding all the surfaces, converting oven space from drop-in to slide-in, and painting. We've got all new appliances (matching our new GE mounted microwave) coming from Best Buy the day after we move so there is much to get done between now and then. As we continue to make progress on the kitchen, I will definitely keep you all posted. In the meantime, be on the lookout for a Ravenswood Zinfandel Braised Short Rib recipe! Preheat oven to 375 F. Grease a 13x9 casserole dish and set aside. Mix breadcrumbs, 2 tbsp oregano, and 1 tbsp garlic powder in one deep cereal bowl and whisk an egg thoroughly in another. Remove 6-8 slices of the ham from the package and set aside. In a small bowl mix the cherry tomatoes, olive oil, and rest of oregano and garlic powder until coated and set aside. Prepare a large sheet of wax paper or plastic wrap to cover meat while flatting. On a large cutting board , trim and clean each piece of pork removing any fat from the edges. Pat dry with a paper towel and lay each piece out on the cutting board with enough space between them to expand vertically. Cover the entire board with the wax paper or plastic wrap and use a meat mallet grooved side to tenderize first, then flat side to flatten each pork chop (shoot for more rectangle piece than round). Once the meat is 1.5-2X larger in length, discard the plastic wrap. Add a slice or so of the ham to cover the pork. Loosely cover the ham with small chunks of mozzarella and spread a light layer of red sauce over the filling with a spoon. Begin at one end of the pork chop and roll the pinwheel so that the filling is trapped inside. Dredge the pork in the egg then the breadcrumbs coating thoroughly and place seam-side down in the baking dish. Repeat for each pork chop. Bake at 375 F for 10 minutes then add the cherry tomatoes and continue baking for 12-15 additional minutes depending on your oven. Serve immediately and enjoy! This recipe works great with chicken breasts too. Just start with thinly sliced or butterfly the breast yourself. Serve with pasta and red sauce for a true Italian feast or consider a fresh salad for a lighter option. I encourage you to experiment with the breading mixture but I would suggest avoiding salty seasonings if using a salty deli meat. "Our mouths are watering for this scrumptious recipe from our member SomedayGourmet! Pair this with a bottle of our Sauvignon Blanc and you've got yourself one tasty, impressive meal! Give this recipe a try then come back and tell us how it tasted in the comments section!" Welcome to KnowYourBeef.info, the online community for beef lovers. "Thanks to SomedayGourmet for submitting this wonderful recipe! This recipe for Roasted Pear and Moscato Vinaigrette will sure to be a wonderful addition to your next salad! Pair this with our Moscato for a truly tasty meal." Preheat oven to 450 F. Combine the mayonnaise and Dijon mustard in a small bowl and set aside. Crack your salt into a small bowl that can be used to pinch while seasoning later. Spray a baking sheet PAM. Wash each filet and pat dry. Place the fish on a cutting board next to each other and sprinkle the entire side with the salt. Using a spatula lightly spread on a generous coating of the mayo/mustard mix then sprinkle half of pecan mixture over the fish evenly. Gently flip each piece of fish and place pecan side down on the baking sheet. Repeat salt, mustard, pecan coating process. Bake the fish in the center of the oven for 9 - 10 minutes or until fully cooked. Serve immediately or tightly cover with foil to keep warm. Serve with Green Beans, Rice Pilaf and Low-Fat Pillsbury Crescent Rolls for a delicious and healthy meal. Add a healthy sprinkle of dill to each side of the fish for a fresh twist on the flavor. Most types of fish are considered done when they're just opaque throughout. The fish should flake easily so be careful when transferring from the baking tray to your serving dish.